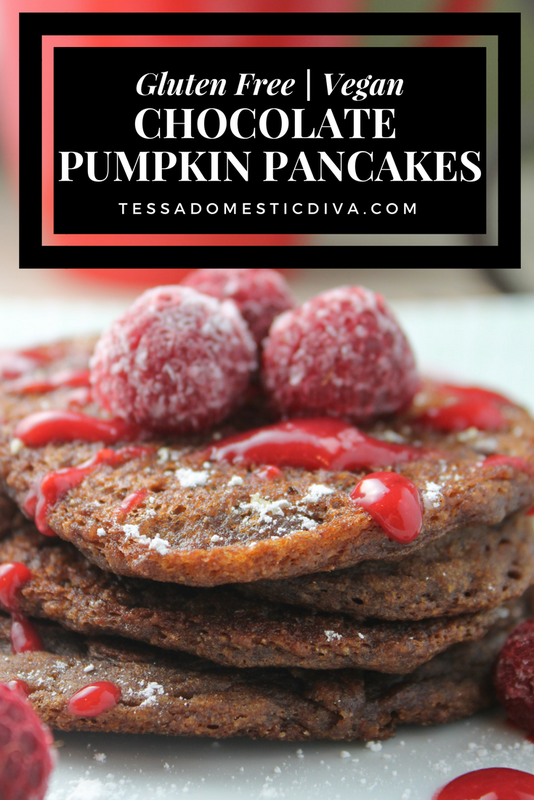 These chocolate pumpkin pancakes may LOOK like a dessert, but there are plenty of healthy ingredients used to make this a wholesome breakfast! 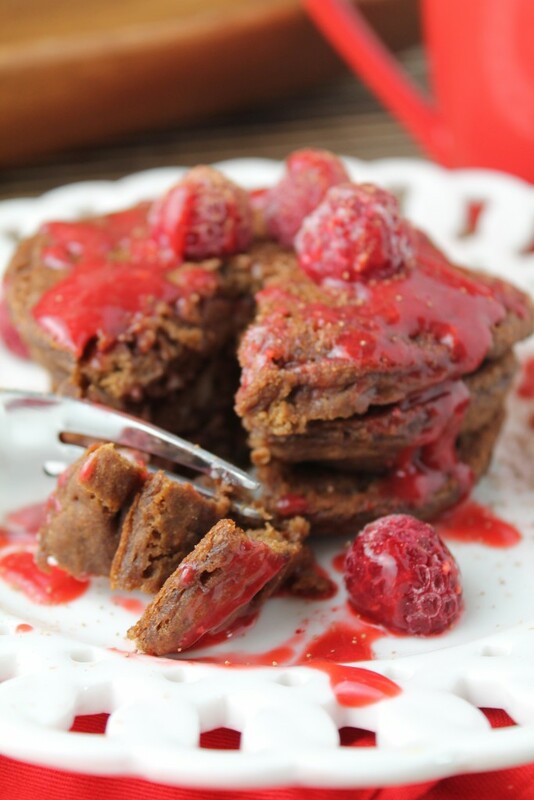 Even better, they are gluten free, egg free, and dairy free for those with allergies! A sneaky serving of vegetables for those kids who shy from them. My daughter asked for chocolate pancakes, and I wanted to offer them to her. But they needed to be as nutritious as I could make them and still get her to eat them. Good lord, the the hoops we jump through as mommies! Craziness! These pancakes almost seemed like a dessert, but with no traditional syrup, and very little sweetener, they were anything but. The combination of berries and chocolate is a marriage made in heaven, enjoy! Any favorite nut butter with sliced bananas! 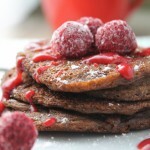 1/4 cup teff flour my favorite gluten free flour!! Whisk the wet ingredients together (I do the whole thing in my blender, all the wet first, then blend in the dry). Make a well in the center of the dry mix and add all the wet ingredients. Whisk the wet ingredients gently to mix, then continue to incorporate the flour mix. Batter will be a typical pancake batter. The moisture content of the pumpkin puree will effect the final viscosity of the batter, so add a few tablespoons of flour or water if needed. I suggest these be pourable for best texture. Thicker batter = thicker and drier pancakes, thinner = thin and more moist, totally a personal preference! Pour batter into 3-4″ circles in a preheated pan, greased. For an extra crispy exterior, I use a generous teaspoon or two of coconut oil to 'fry' the batter. Less oil works, but the crunchy texture is a nice touch. I usually am just about medium heat. When you see little bubbles work their way to the top, it is time to flip and cook the other side. In a small saucepan over medium heat, cook the berries and sweetener until all fruit is soft and warm, about 5 minutes. Could also heat in a microwave for 2-3 minutes. Place the whole mixture in a high powered blender to completely pulverize any seeds, or use an immersion blender if the seed texture is OK with you. You could also strain the berry puree through a sieve to remove the seeds. Makes about 1 cup sauce. These look delicious! Thanks so much for linking up on Thank Your Body Thursday. Hope you’ll come back and link up some more great stuff! 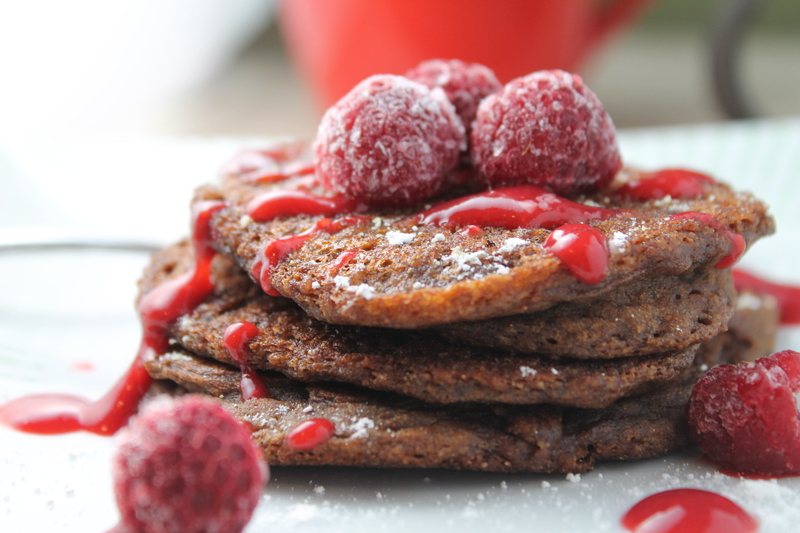 Your pancakes are making my mouth water! I adore chocolate and berries together. What a lovely autumn breakfast! Yes APril, chocolate and berries are swoon worth for me too! Oh, Tessa, you amaze and blow me away week by week with your most amazing recipes! Thank you for sharing with us at Healthy 2Day Wednsdays. I am starting to guess your recipes before I even look to see if they are yours! You are amazing and I am so blessed to have these recipes for future making. Thank you!!! Such gracious praise Carrie! You flatter me! I so hope some of my recipes you make live up to it! These look ridiculously tasty Tess! Hard to go wrong with chocolate and pumpkin, huh Gabby? !